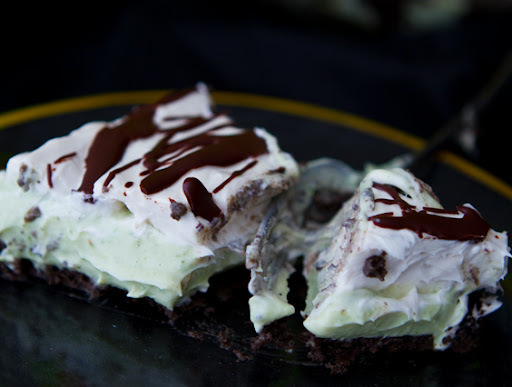 Still on my vegan cream pie kick, I was inspired by a mint-chocolate classic: Minty Grasshopper Pie with a rich mint-chocolate drizzle. 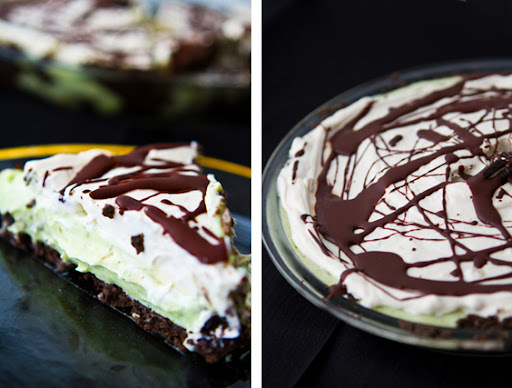 Spoon-dive into this luscious bite..
Minty Cloud Pie. 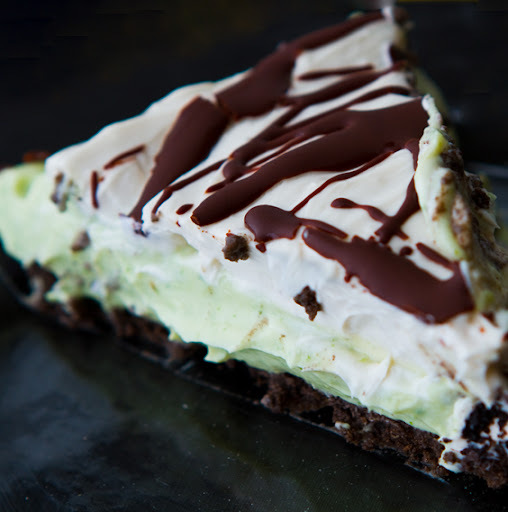 Layers of green soy-based mint-vanilla pudding mingle with a chocolate cookie crumble crust and minty white, whipped fluff on top. All vegan. And that mint green color with tiny mint-colored specks is 100% natural. It was achieved by blending in a pinch of baby spinach (but don't worry, you can't taste it). 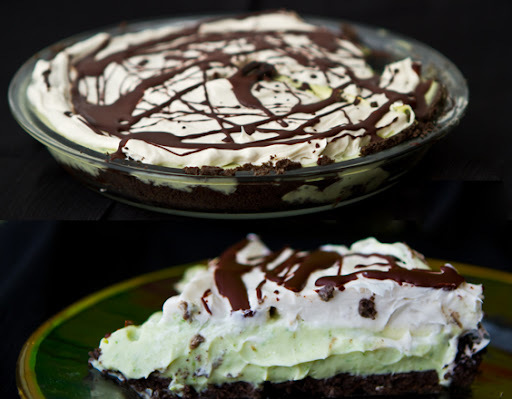 This silky, creamy, cloud-like pie will refresh your palate and make all your mint chocolate dreams come true!.. Cream Pie. So I have bought up all the "Healthy Top" at my local Whole Foods. I think I've gone through 3 boxes of the stuff in the past week with all my cream pie experiments (and I still have one left in the fridge). My pies so far..
Chocolate Cream Pie. And now this minty pie. I think I will have to do at least one more cream pie before my obsession is done. Hmm. Banana Cream Pie? Oh shoot, maybe Coconut Cream Pie too. And Lemon Cream Pie. And my childhood fave, Boston Cream Pie. But that's it. Really. 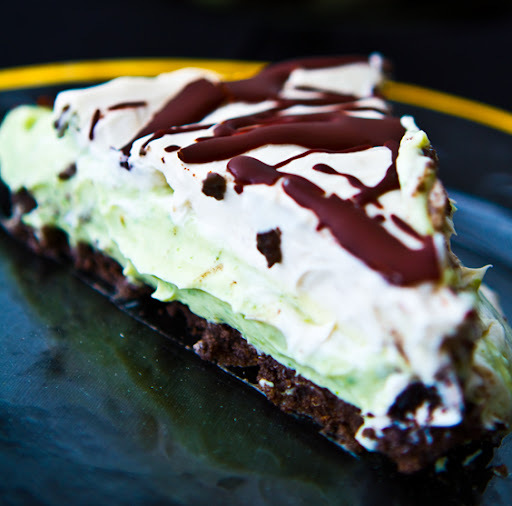 Anyways, lets stick to today's mint-chocolate deliciousness: Grasshopper Cream Pie. And if you don't have the "Healthy Top" by Mimiccreme (info in this post) to give you that fluffy white whipped topping - you can do another layer of tofu pudding. 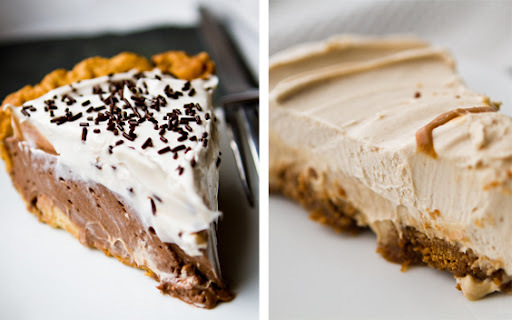 Or simply have a one layer pudding pie. Or if you are really savvy, make your own coconut cream topping. Or use some store-bought Soy or Rice Whip. But no matter what "fluff" you use, the green pudding part is so yummy it won't really matter. Custard-Firm or Pudding-Soft Pie? If you want to use the agar agar (step 1) go for it - the agar firms up the texture of the pie so it "slices" rather than "scoops" when you serve it. I used a bit of agar - but only about 1 teaspoon. I'd suggest using about 1-3 teaspoons for a slice-able pie. 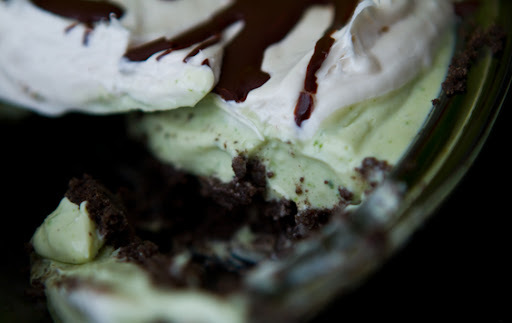 Alternative green cream topping: Whipped Coconut Cream from Coconut Milk, How-to! 1. Heat the soy milk and coconut milk over high heat with the agar agar. Stir until agar is dissolved. Turn off heat. Add in coconut oil - allow to soften in warm mixture. 2. In a high speed blender, add your pudding ingredients, plus the agar mixture (I like to strain the agar mixture into the blender just in case a few agar beads remain). Blend until smooth. Taste test. Adjust sweetener or salt if needed. 3. Crush your cookies - for garnish - prepare your cookie crust if not using store bought. 4. 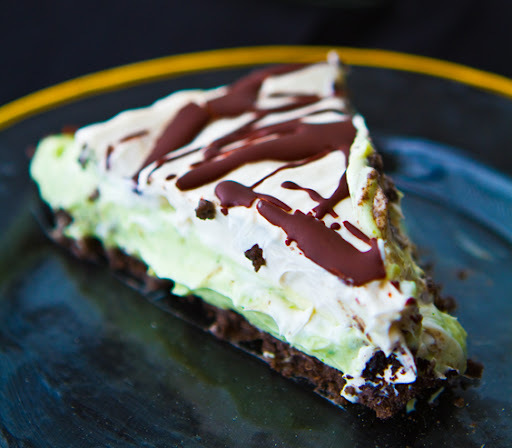 Start assembling your pie - pour the green pudding into crust. Place in fridge to chill for at least an hour. 5. When pie has chilled and firmed up - at least an hour or so - whip your white topping. With a hand mixer, whip your "Healthy Top" whipped topping – with the peppermint. Add in an even layer to the pie - over top the green layer. Place back in fridge to chill for at least a half hour. 6. Lastly, melt your vegan dark mint chocolate with 1 Tbsp coconut oil. Allow the melted chocolate to cool for a bit - to the point where is isn't steaming hot, but still drizzle-able. 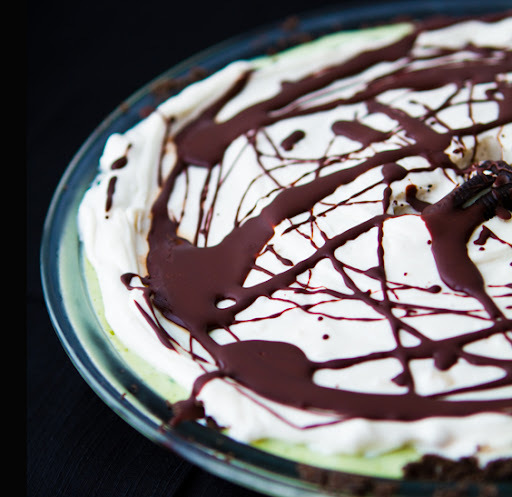 Drizzle over top chilled pie - splattered design. Place pie back in fridge for at least a half hour before serving. 1. In a high speed blender, add your pudding ingredients. Blend until smooth. Taste test. Adjust sweetener or salt if needed. 3. With a hand mixer, whip your Healthy Top whipped topping – with the peppermint. 4. 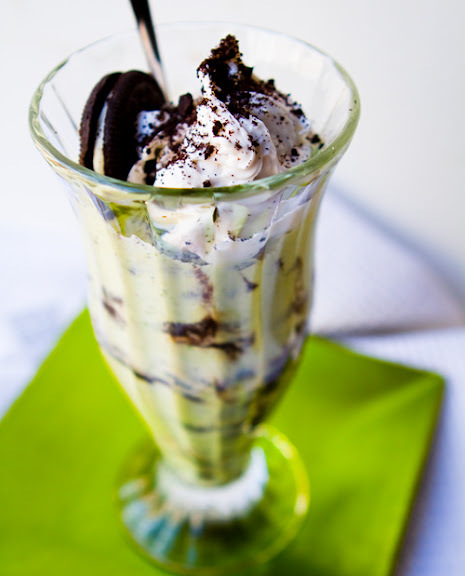 Start assembling your parfaits – cookies, pudding, whipped topping (repeat). 5. Top with cookie crumbles. 6. Chill in fridge for at least an hour so that pudding can firm up and chill.